A rapid turnover of emperors, many of whom rose out of the ranks of the army (the term ‘barracks emperors’ is sometimes used), nearly all of whom met violent deaths. Almost uninterrupted warfare, both civil and foreign. Monetary collapse – the silver denarius was almost totally debased by the 260s. Valerian became undisputed emperor in 253 – his rival, Aemilian, having been killed by his own troops after a reign of only three months. The Empire's frontiers were threatened on all sides – the main antagonists being the Franks, the Alamanni, the Goths, and the Persians. Valerian immediately shared power with, his adult son, Gallienus – Valerian assumed responsibility for the eastern half of the Empire, Gallienus the western half. Unfortunately, there is no surviving contemporary narrative of these eventful times. There are four Latin-written sources from the second half of the 4th century: Aurelius Victor, Eutropius, the ‘Epitome de Caesaribus’ and the ‘Historia Augusta’, and two, much later, Greek-written sources: Zosimus and Zonaras. The Latin story and the Greek story are sometimes contradictory. The two Byzantine historians, Zosimus and Zonaras, preserve snippets of Dexippus of Athens, who wrote soon after 270. The Latin sources, which, with one notable exception, carry only brief summaries of emperors' reigns, chiefly draw on a single, early-4th century, source, known as the ‘Kaisergeschichte’. The exception is the ‘Historia Augusta’ which, though usually following the ‘Kaisergeschichte’, also knows Dexippus, and is notorious for mischievously weaving an elaborate web of fantasy around a slim thread of history. In 260, whilst campaigning against the Persians, in Mesopotamia, Valerian was taken captive. The chronology of this time is not at all clear. The literary sources are not in agreement about the dates, nor indeed order, of Valerian's capture and the rebellion of Ingenuus. Aurelius Victor (in Chapter 32) places Valerian's capture in “the sixth year of his reign”, i.e. in 259, and, in the ‘Historia Augusta’, Trebellius Pollio avers (The Two Gallieni Chapter 21) that “all agree .. Valerian was captured in his sixth [year]”. But the ‘Epitome de Caesaribus’ says (Chapter 33) Gallienus ruled for “seven [years] with his father”, which would place Valerian's capture in 260. Whilst Aurelius Victor clearly places the rebellion of Ingenuus after the capture of Valerian, Trebellius Pollio (Thirty Tyrants Chapter 9) dates the rebellion to “the consulship of Tuscus and Bassus”, i.e. 258, which is before. Valerian's coinage was still being minted in Alexandria at the end of August 260 – but possibly this simply indicates that, though he had been captured the previous year, his loss had not yet been officially accepted. At any rate, the most popular current opinion seems to be that Valerian was captured in the summer of 260 – but the debate continues. How Ingenuus' rebellion slots into the story is also the subject of debate. The simplest view is to accept Aurelius Victor's train of events, which has the advantage of providing motivation for Ingenuus' actions. A possible neat solution is to accept Victor's date, 259, for Valerian's capture, but to propose that Trebellius Pollio, in the ‘Historia Augusta’, inadvertently placed Ingenuus' rebellion in the consulship of Tuscus and Bassus instead of Aemilianus and Bassus, which is 259, and thus agrees with Victor. There are, of course, other theories – you pays your money and you takes your choice! Eutropius says (Book IX Chapter 7) that “the Germans [the Alamanni] advanced as far as Ravenna”. Zosimus, however, says (Book I Chapter 37) that “the Scythians ... penetrated Italy as far as Rome”. Presumably, when Zosimus says “Scythians”, usually meaning the Goths, he actually means the Alamanni. At any rate, Zosimus goes on to say that Gallienus “continued beyond the Alps, intent on the German war [against the Franks, presumably]”, so the Romans scraped together an ad hoc army which scared off the “Barbarians”, who then “ravaged all the rest of Italy”. Eventually, Gallienus went “to Rome to relieve Italy from the war which the Scythians were thus carrying on”. Zonaras says (Book XII Chapter 24) that Gallienus defeated 300,000 Alamanni, at Milan, with a force of just 10,000. An inscription, found at Augsburg (in Roman times: Augusta Vindelicum, capital of the province of Raetia) in 1992, celebrates the defeat of a band of Iuthungi (a component of the Alamanni) in the April of, probably, 261. The inscription notes that “many thousand Italian captives were freed”, so the Iuthungi must have been returning home from a raid on Italy. No doubt Gallienus took a considerable number of troops from the Rhine frontier to confront Ingenuus. It would seem reasonable to suggest that the Alamanni and the Franks took advantage, and managed to penetrate deep into the Empire. * Incidentally, the mention of the Franks by Aurelius Victor, above, is their first appearance in history. During his absence, Gallienus had left his son, the Caesar Saloninus, in nominal charge. * Saloninus was under the guardianship of one Silvanus (or Albanus), whilst the army was under the command of Marcus Cassianius Latinius Postumus. The ‘Epitome de Caesaribus’, however, compounding the chronological uncertainty, implies that it was Valerian Junior who was killed during Postumus' rebellion. Nevertheless, most modern writers seem to accept that the son of Gallienus killed by Postumus was Saloninus, and place the event, after Valerian's capture, in 260. Neither Aurelius Victor nor Eutropius mention that Saloninus was killed – in fact, Eutropius' brisk résumé mentions no son of Gallienus at all. The ‘Epitome de Caesaribus’, though it says that Gallienus' son was killed when Postumus came to power, does not say he was executed. Zosimus and Zonaras, however, are explicit on that point. Valerian's glowing testimonial is, without doubt, an invention of the ‘Historia Augusta’. At some point, Gallienus again marched against Postumus. He besieged him in an unnamed Gallic city, but received an arrow wound in the back and was obliged to abandon the siege. He clearly never achieved a decisive victory over Postumus. 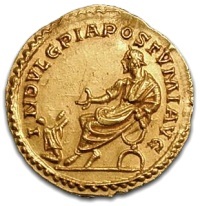 An aureus of Postumus. The reverse depicts his “dutiful generosity”. His coinage was superior to Gallienus' in terms of metal content, and also, it is generally felt, in artistic terms. Aurelian was murdered in 275. There followed a short interregnum before Tacitus (said to be seventy-five years old) was chosen as his successor. Tacitus reigned for about seven months before he too was (probably) murdered, and his praetorian prefect, Florian, assumed the purple. The army in the East, though, hailed their commander, Probus, emperor. The opposing factions met at Tarsus. Apparently, Florian's army, being mainly composed of Europeans, was overcome by the extreme heat. Only a few skirmishes were fought; Florian was killed by his own soldiers (having reigned for around two months). In 283, whilst campaigning against the Persians, Carus suddenly died. Carinus and Numerian continued to rule. Carinus (or an officer despatched by him) would seem to have fought a successful campaign in Britain, since both he and his brother acquired the title Britannicus Maximus. Numerian was killed in November 284, and the army declared a Dalmatian guards officer called Diocles emperor. * Diocles took the name Diocletian. Carinus, pausing to suppress the rebellion of one Julianus, at Verona, marched against Diocletian. The two armies met, in 285, at a site near Belgrade. Carinus' larger army was apparently at the point of victory when he was murdered by his own men,* leaving Diocletian as undisputed emperor. It is conjectured that the British village – in Latin: vicus Britanniae – is a corruption, and that it should be vicus Britannicus, i.e. a village settled by Britons (presumably auxiliaries in the Roman army). It is further conjectured that this vicus Britannicus has, over the centuries, metamorphosed into, the German, Bretzenheim. At any rate, Alexander certainly wasn't killed in Britain, and there is no place in Britain known to have been called Sicilia. Incidentally, Zosimus tells a unique story, presumably based on a misunderstanding of his source material, which has Alexander killed in Rome. In 380–81, St Jerome (Hieronymus) translated chronological tables – a summary of world history, beginning with Abraham's birth and finishing in AD325 – composed by Eusebius of Caesarea, into Latin from Greek (the original Greek text no longer exists), but making additions from Roman history in the process. Jerome also continued the ‘Chronicon’ (Chronicle) to 378. A grouping of Germanic tribes along the lower Rhine. Their first mention in history is during this period. According to their own tradition (as recorded by Jordanes, in the mid-6th century), this Germanic group originated on the island of Scandza, which would seem to be the southern end of the Scandinavian peninsula. Be that as it may, by this time they were occupying territory adjacent to the Black Sea, between the Danube and the Don. They later split into two factions – the Ostrogoths (Eastern Goths) and the Visigoths (Western Goths). Persia was once again under Persian rule (the Sassanid dynasty) – the Parthians having being overthrown in 224. Zonaras agrees (Book XII Chapter 24) that it was the Moesian legions who proclaimed Ingenuus emperor. Moesia comprised; most of Serbia, part of Macedonia and part of Bulgaria. Moesia was also divided into two provinces: Moesia Superior and Moesia Inferior. Illyricum was a general term for the Pannonia/Dalmatia/Moesia region. Mursa was in Pannonia Inferior. In the first half of the 12th century, John Zonaras, after holding offices in the court of, Byzantine emperor, Alexius I Comnenus, became a monk, and compiled his ‘Epitome Ton Istorion’ (Epitome of Histories) – an eighteen book universal chronicle, written in Greek, extending from the Creation to the death of Alexius in 1118. Zonaras is, perhaps, best known for preserving, albeit in abridged form, the first twenty-one books of the ‘Roman History’ of Dio Cassius. His record of the 3rd and 4th centuries, taken from now lost sources, is also important. The land between the rivers Tigris and Euphrates – roughly equivalent to modern Iraq. Trebellius Pollio makes no mention of Silvanus/Albanus. Mention was made earlier of an inscription from Augsburg, the capital of Raetia, celebrating the defeat of a band of Iuthungi. The inscription is dated 11th September, in the consular year of Postumus Augustus and Honoratianus (consuls of the Gallic Empire of course). This probably equates to 261. In the ‘Historia Augusta’, Trebellius Pollio twice asserts that it was seven years. Postumus would appear to have ruled 260–269. Comprising parts of: Austria, Switzerland, Germany. Quote taken from ‘Gallienus: a study in reformist and sexual politics’ by John Bray (1997). Aurelius Victor says (Chapter 33) that Aureolus was "in command of the legions in Raetia". Trebellius Pollio (‘Historia Augusta’), in what would clearly seem to be an allusion to the Thirty Tyrants of Athens, contrives to list thirty tyrants – meaning usurpers or pretenders – during the reigns of Valerian and Gallienus. In order to make up the numbers, he includes in his list: pretenders who do not fall within the timescale, persons who were not pretenders at all, and individuals who are thought to be total fabrications. Out of Pollio's thirty, perhaps as few as nine truly fit the bill. Paulus Orosius wrote his ‘Historiarum Adversus Paganos Libri Septem’ (Seven Books of History Against the Pagans) at the request of St Augustine of Hippo, in about 417. ‘Caesar’ was the title conferred on an emperor's junior colleague and intended heir. The emperor himself was titled ‘Augustus’. When Valerian assumed power, he raised his son, Gallienus, to the same rank, i.e. Augustus, as himself. He subsequently raised Gallienus' son, also called Valerian, to the rank of Caesar. When Valerian Junior died – numismatic evidence suggests it was in 258 – Gallienus' younger son, Saloninus, replaced him as Caesar. 258 is also the year that the ‘Historia Augusta’ claims Ingenuus rebelled, and some writers suggest Valerian Junior was killed in the rebellion. Presumably this was the story told by the ‘Kaisergeschichte’. According to Aurelius Victor (Chapter 33) Gallienus had enemies in the senate, and it is widely believed that hostile senators were the source of the, in all likelihood unwarranted, slur on Gallienus. The testimony of Zosimus, regarding the invasion of Italy, presents something of a conundrum though. It would seem to make more sense if Gallienus had intercepted the Alamanni on his way back from Illyricum, rather than from “the German war” – which would suggest that Gallienus travelled all the way from Illyricum to the lower Rhine; the Alamanni then invaded (which, with Gallienus' forces back in place, might seem unlikely); Gallienus then doubled back “to relieve Italy”. Perhaps Zosimus simply made an assumption, since he makes no mention of the rebellion of Ingenuus. ‘Panegyrici Latini’: ‘V. Speech of Thanks to Constantine’ Chapter 4 (Anonymous, written c.311), ‘IX. For the Restoration of the Schools’ Chapter 4 (Eumenius, written c.298). Possibly the fleeting rule of Domitianus, recorded by two coins, should be placed in 274. Zosimus mentions (Book I Chapter 49) that Aurelian punished a person named Domitianus for an unspecified act of rebellion. Postumus, Victorinus and Tetricus all feature in British inscriptions – mainly on milestones. Worthy of note, however, are altars from the fort at Birdoswald, on Hadrian's Wall, where, on two, the First Aelian Cohort of Dacians are styled Postumiana (Postumus' Own) and, on another, Tetriciana (Tetricus' Own). The Sebosian Wing of cavalry are also titled Postumiana, on a building inscription from Lancaster. Zonaras ‘Epitome Ton Istorion’ Book XII Chapter 28. Zosimus ‘New History’ Book I Chapter 64. According to Zosimus (Book I Chapter 63) and Zonaras (Book XII Chapter 28), Tacitus was murdered by soldiers, who had already murdered a kinsman of his, to escape punishment. However, Aurelius Victor (Chapter 36) and Eutropius (Book IX Chapter 16) say that Tacitus simply died, whilst the ‘Epitome de Caesaribus’ (Chapter 36) adds “from a fever”. Flavius Vopiscus of Syracuse (‘Historia Augusta’ Tacitus Chapter 13) knows of both versions of Tacitus' death, but doesn't venture an opinion as to which is correct. Elsewhere (Four Tyrants Chapter 14) Flavius Vopiscus says that Bonosus' father was a British teacher. It is likely that both of these assertions are fabrications. Literally ‘trousered Gaul’ (after the bracae worn by the native population). A jocularly disparaging reference to the more distant (from Rome), and hence less civilized, parts of Gaul. The Vandals were one of the Germanic peoples against whom Marcus Aurelius had fought, on the Danube, a century earlier (in the, so-called, Marcomannic Wars). In 271, Aurelian defeated Vandals who had invaded Pannonia. As part of the ensuing treaty, the Vandals supplied 2,000 cavalrymen to the Roman army. Writing in the 1st-century AD, Pliny the Elder uses the term Vandal in a general sense – including the Burgundians and Goths (Gutones) as part of the Vandal nation. Gaius Plinius Secundus, better known as Pliny the Elder, was the author of ‘Natural History’, a 37 book encyclopedia, to which he was putting the final touches in AD77. Pliny discusses Germany in Book IV Chapter 28. East Germanic tribe, possibly having Scandinavian origins. This is the first recorded military encounter between the Burgundians and the Romans. South of the Danube, sandwiched between Raetia and Pannonia. Modern Austria, more or less. All sources report a story that he was killed by lightning. Aurelius Victor doesn't mention the relative size of the armies, but says (Chapter 39) that while Carinus “was in hot pursuit of his defeated foes he died under the blows of his own men because he could not control his lust and used to seduce many of his soldiers' wives”. Eutropius says (Book IX Chapter 20) that he “was betrayed by his own troops, for though he had a greater number of men than the enemy, he was altogether abandoned by them”. Flavius Vopiscus of Syracuse (‘Historia Augusta’ Carus, Carinus & Numerian Chapter 10) simply says Diocletian “met in battle and put to death” Carinus. These three sources agree that the battle was fought on the River Margus, though Eutropius is more precise in his location. The ‘Epitome de Caesaribus’ doesn't mention the battle, but says (Chapter 38) that Carinus was “tortured to death chiefly by the hand of his tribune, whose wife he was said to have violated”. Oddly, Zonaras (Book XII Chapter 30) has Carinus “living in Rome”, and Diocletian killing him there. None of the sources has a good word to say about Carinus. Numerous resemblances – the selection of facts, shared errors and similar phraseology – between Aurelius Victor, Eutropius and the ‘Historia Augusta’, led Alexander Enmann to conclude (in a paper published in 1884) that they had drawn on a common, no longer extant, source. This phantom work is known as the ‘Kaisergeschichte’ (History of the Emperors).